Dog Site: Is there anything I should know before Selling Puppies? Is there anything I should know before Selling Puppies? The main thing is to have the puppies at least eight weeks old before parting with them. 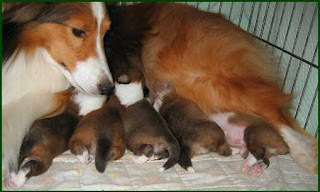 Younger puppies often get ill in inexperienced hands. Only when you have met as many ill-advised dog-owners as I have, will you realize how incapable many of them are. Never give an express warranty. This may get you into trouble. If you are asked, “Do you guarantee them show specimens, or healthy, etc. ?” simply reply, “In my opinion they are.” No one can take you to court over your opinion. Always give the new purchaser a written-out diet sheet, and the pedigree and registration certificate. It is always wise to register the puppy in your name and then transfer it. If the puppy is over nine weeks old, have it vaccinated before selling it and hand the certificate to the purchaser. Remind the new owner to keep the puppy warm in the way home. It has been accustomed to being with its brothers and sisters. I always wish breeders would charge a little more for their puppies and include a book on training with the purchases of the puppy. This action would save so much recrimination. Always worm the puppies before you sell them, and inform the purchasers of the date it was done. Never sell a runt; have it destroyed at birth. It never pays to rear rubbish. The vet will put it to sleep for you. Beware of dealers coming round to buy your puppies enbloc. They sometimes get the most appalling treatment, ending up in pet shops or dying of cold. Make sure, as far as possible, that the people who buy the puppies are dog lovers and reasonably sensible.